I am not a shorts person. I own a couple pairs, but am just not a fan of shorts. So, in anticipation of the summer (heck, we already are enjoying warm temps!) I ordered myself a couple skirts from Old Navy. And seriously, these have got the be the most amazing skirts ever...I ordered two of the same style. I live life on the edge like that. These skirts are soft and easy to wear. And, they go with just about anything. I pretty much plan on living in them this summer. Why are you still reading this?! Has my semi-out of focus picture not convinced you to order the skirt?! You need to. This isn't a want, it's a need. Seriously. Oh, and the icing on the cake? Paired with a sale, I scored my skirts for $10 each. Just buy one already, ok?! You WILL thank me later. And for a couple other details of my outfit. I am one of those people that think I am really going the extra mile when I throw a necklace on. And long necklaces are my friend. Given that I always wear the same one, I was pretty excited to get a new one the other day. 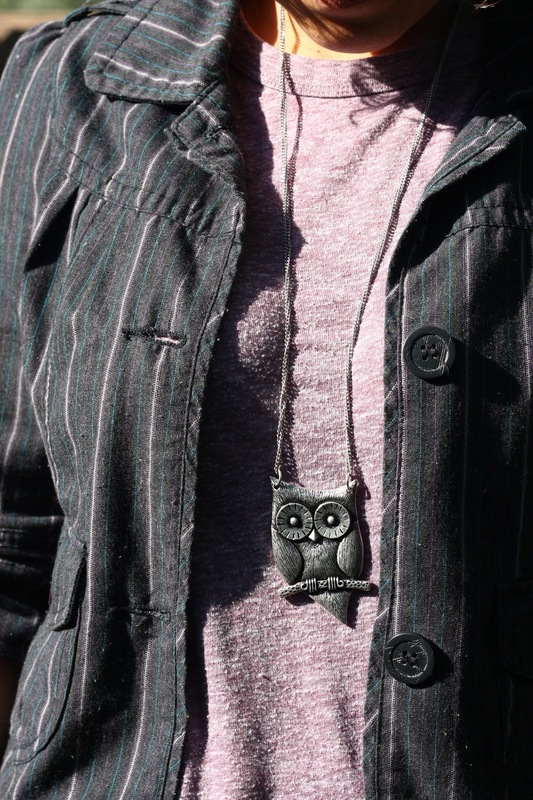 Isla is fond of my owl necklace as well. And, well, I promised myself last year that this year I would get myself a cute pair of sandals and stop sporting my flip flops with everything (now I only wear them 6 days of the week instead of 7!). So, I was pretty pleased when I came across these lovely sandals at Target. They are super comfortable. And though I have to admit, it was the color that drew me to them, I like them so much, I am thinking of getting some in another color as well. But really, all I want you to know is this Old Navy skirt is the best ever. And Old Navy did not sponsor this post or give me a free skirt (though I would love one). I just love this skirt that much. Well, looks like I need a trip to Old Navy, even if the temperatures are nowhere near warm in Wisconsin!